La Crosse, WI – May 15, 2018 – Visitors to the first annual Driftless Sports Convergence can expect 50,000 square feet of kayaks, canoes, bikes, camping, fishing, archery, hiking, equipment and information brought to the area by top experts and retailers. Celebrity Appearances featuring Outdoor Channel’s Pat & Nicole Reeve of Driven TV who will be sharing “Tips On Hunting Mature Whitetails” as well as holding a meet & greet following the presentation. Gene “Flukemaster” Jensenwill also be sharing his passion for bass fishing during his presentation “Catching Bass in the Grass” Saturday on the mainstage. Visitors may also participate in a Catch-Photo-Release Kayak Bass FishingTournament. The open-registration Catch-Photo-Release kayak bass fishing tournament will be on the Mississippi and Black Rivers near La Crosse, Wisconsin, paying out 10% of the field, with $1,000 minimum to first place. Children are also invited to attend to check out multiple showings of Birds of Prey, demo an electric bike, try archery tag, take a mountain bike class, see Hans Mayer Music for Kids or try out Shenanigan’s Hamster Balls. Visitors are invited to learn fly tying and casting, disc golfing, map apps, trail building, canoe camping, and more. Attendees may also upgrade equipment while enjoying food trucks, live music, and log rolling. 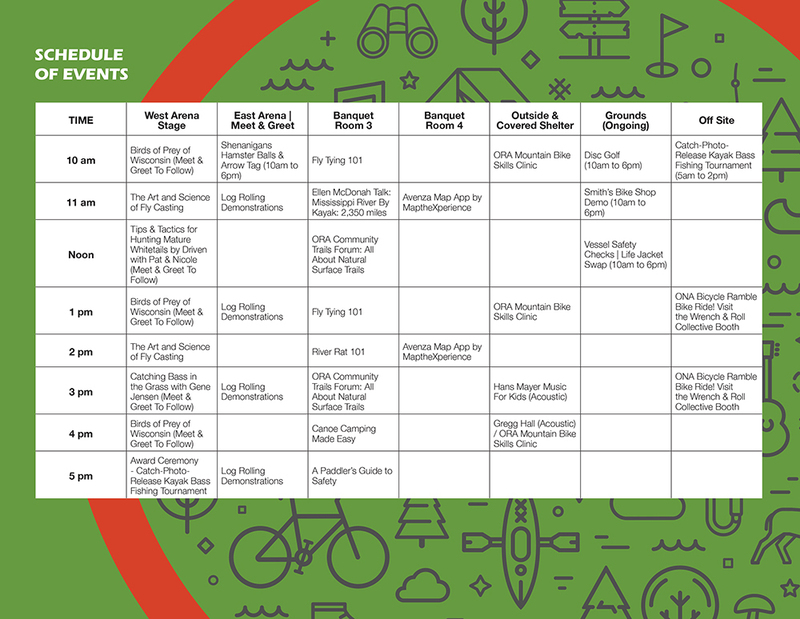 A current schedule of events is available at www.driftlesssports.com.